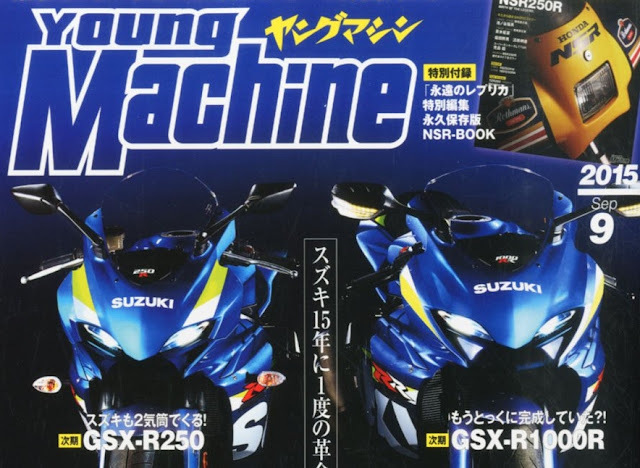 Suzuki is believed to be working hard on delivering a new generation of GSX-R motorcycles, at least this is what the Japanese magazine Young Machine believes. The cover of the September issue is dominated by not one, but two Hamamatsu machines that are said to be revealed soon. The GSX-R family is in need of a solid revamping, possibly receiving a thorough update in all departments, including the engine, frame, and bodywork. At the same time, Suzuki is the only big manufacturers without a sport quarter-liter or 300cc machine on the worldwide markets. If we are to believe Young Machine, the latter might finally arrive, in the shape of the GSX-R250, a bike mimicking the looks and vibe of the liter-class Gixxer and addressing new riders who want to get into the sportbike world. Suzuki GSX with the dual-headlight design? The Japanese magazine depicts two bikes with fairly similar looks, and liveries that seem to replicate those of the MotoGP machines, in racing blue and huge Suzuki white lettering. What's even nicer is seeing that the quarter-liter bike looks very similar to the liter one. Young Machine changed dramatically the design of the front cowl for Suzuki, introducing a dual-headlight design that's kind of missed from Hamamatsu's sport bike range for quite a long time. Some might say it has tiny dash of R1 to it, but this is most likely because of the smaller optical clusters. The front end looks a tad more organic and sort of reminds us about Akrapovic's "alien" exhaust. This may be a good thing or a bad thing, since beauty is in the eye of the beholder. Another interesting detail on the cover of Young Machine is the RR lettering on the fairing of the liter-class bike. This might indicate that Suzuki is planning to up the game and increase both power and torque for the upcoming GSX-R100R. Power figures north of 200 hp are rumored, with the new engine receiving a crossplane crankshaft, with racing ABS, traction control, riding modes and multiple mappings on the list, as well. If any of these are true, we might get to see the new GSX generation machines at EICMA, most likely. Still, nothing is certain, and these bikes may be only for the Japanse market.